“Please hurry!” a frantic Jessica Moore is heard early Monday in the background of a 911 call between her boyfriend, Joshua Coyle, and a Columbus fire dispatcher. Moore and Coyle were huddled in a basement bedroom of the five-room ranch home at 829 Groveport Rd. in Canal Winchester. One team of firefighters battled through flames and smoke from the east side of the home while another team sawed its way through the home’s western wall and floor to reach the couple. Coyle, 23, and Moore, whose age was unavailable, were in critical condition Monday afternoon at Ohio State University’s Wexner Medical Center, suffering from smoke inhalation, according to fire officials. The hospital would not release any information, even to verify that the couple was there. The call about the fire came at 5:34 a.m., Bates said. Township crews just around the corner at the Gender Road station were able to respond quickly. Fire crews from Columbus and Bloom Township arrived to help. Bates said the home’s owners, John J. Marcum, 44, and his wife, Linda Marcum, 47, were awakened by smoke detectors. “This is a case where working smoke detectors and the fact they had their bedroom door closed helped save their lives,” Bates said. The closed door kept heavy smoke from overcoming them in their sleep, he said. The Marcums were faced with acrid smoke from the ceiling down to chest level when they opened their bedroom door. But they couldn’t run to safety yet. They had to rescue their two elementary-school-age children sleeping in another bedroom. Fortunately, the children’s bedroom door also was closed, Bates said. Gathering up the children, the Marcums escaped as a ceiling behind them collapsed in flames and hot cinders. “They turned around to go back inside to rescue the other two but couldn’t,” Bates said. Fire and debris blocked the way. A next-door neighbor, Brian Carney, had broken through a privacy fence to go around behind the house. He figured he might be able to get in through a back window or door. “You couldn’t get within 20 feet of the house; it was just too hot,” Carney said. The siding on Carney’s home facing the fire was melted and sagging. 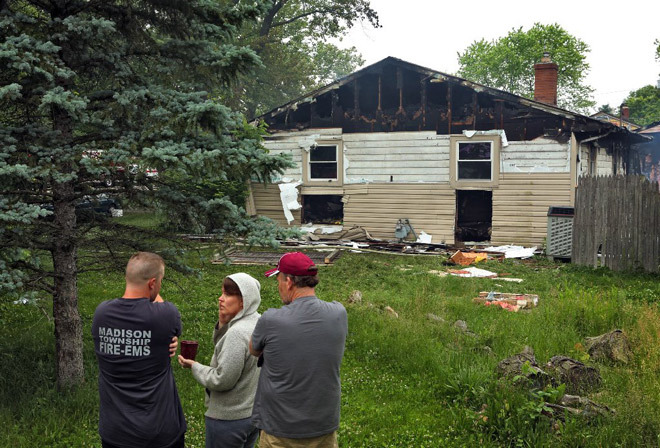 The fire had destroyed about half of the Marcum home’s interior and roared through the attic, exposing the attic at both ends and leaving the roof sagging. Coyle sounded calm when he repeated the dispatcher’s advice to “Just relax,” but it was unclear, based on the recording, when he and Morris suffered their injuries. They were reassured when they heard firefighters breaking through the ceiling above. Firefighters lowered a ladder, climbed down and took Morris out. 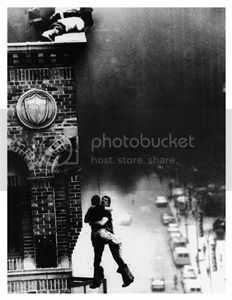 About the same time, firefighters came down the steps and got Coyle. It had been about 20 minutes from the time the fire was reported until the couple emerged from the basement, Bates said. The fire destroyed about half of the Marcum home’s interior and roared through the attic, exposing the attic at both ends and leaving the roof sagging.Two Columbus firefighters were taken to a hospital for treatment of minor injuries, the chief said. The fire appeared to have started in an attached garage that was being used for storage. Although the cause was unknown on Monday, Bates said the fire was not suspicious.